When you sell a product or a service, being a seller or a buyer, you enter into an agreement to exchange goods and services for money, and as a result, execute a complete financial transaction. This agreement is usually in the written form, or can also be entered into verbally, and the transaction terms are written and recorded in a receipt and invoice. Both of these documents are the source documents for a financial transaction. The purpose of both the documents is to record accounting transactions in order to account for receipt and request for payments. The receipt is a document, which gives a confirmation that payment has been made by the buyer to conclude the sale. In most cases, receipt is considered as a proof of ownership of products for the buyer of a product. The details of goods and services, such as, its price, tax charge, discount allowed, credits, and method of payment, are mentioned in the receipt. For example, when you purchase petrol for your vehicle at a petrol station, you get a receipt from a seller in which detailed contact information of a seller is provided, but the information related to the buyer is either limited or not included in that document. Invoice, on the other hand, is considered as a piece of document with a request for payment. It is also known as the bill for selling products or services. This document is usually prepared by the seller or vendor, who supply goods and services to a customer. The seller mentions the number of services or products provided by them on that piece of paper, along with its selling price, tax charge, discount offered, and the net total price. Moreover, other information, such as, an invoice number, name of a person selling the goods, special sale programs offered to customers, and credit information is also included in invoice. For example, in case of credit purchases, you may have seen that it is stated on many invoices that a special discount will be offered if a customer makes the payment within 10 days of purchasing the product, and that the payment for a product or services can be made within 20, or in some cases 30 days of the sale. Contact information of a seller, including name, phone number, address, fax number or email address, is also mentioned in the invoice. Apart from this information, the contact detail of a buyer, and time of sale is also mentioned in an invoice. However, make sure you do not confuse invoice with the Purchase Order (commonly known as PO), which is a written document by a buyer to the vendor, in which authorization of payment terms along with the delivery or shipment of goods is made. 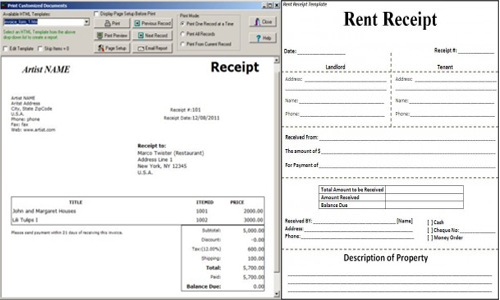 Recipient of receipts is the customer or client, who makes the payment, and as a result, receives a document (receipt) for confirmation that the payment has been made. On the other hand, invoices are usually issued by the provider of goods and services, for example, a physician issues an invoice to the patient for the services provided by them, and a waiter issues an invoice (commonly known as a bill) to people who dine in a restaurant. When a seller has to make a request for payment from a buyer, he creates an invoice. Invoice keeps track of the sales, enable smooth delivery of goods and services, and also assists a company’s management to keep a better control on inventory. It is a very useful piece of the source document for management as it also keeps track of expected future revenues, helps in maintaining a good professional relationship with customer by offering them special terms like early payment discounts, or extended period to pay. Receipts, on the other hand, are used by the customers as a source document to indicate that they made a payment for certain goods and services, especially in case of defective goods or where the services were not provided. Hira Waqar. "Difference between Receipt and Invoice." DifferenceBetween.net. December 10, 2014 < http://www.differencebetween.net/business/difference-between-receipt-and-invoice/ >.